The Korea Herald reports that 2019 will be a cutthroat yet exciting year for South Korea’s telecommunications industry as the introduction of faster fifth-generation telecom networks in March will bring on upheavals in their own and other industries. 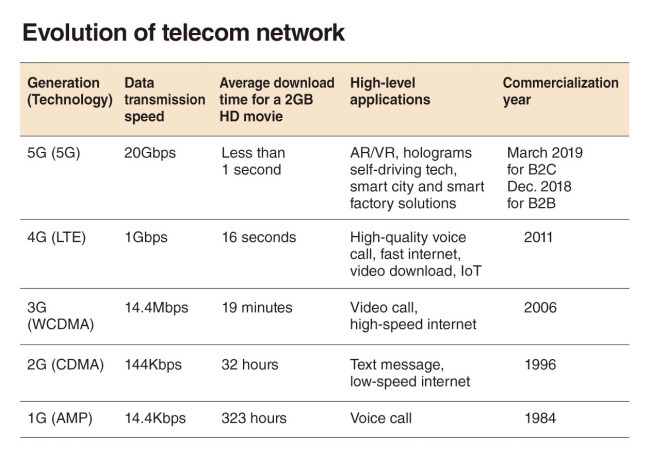 The Korean mobile operators at the forefront of the 5G commercialization are widely expected to escape their traditional areas of business, mainly centering on providing high-speed internet and high-quality calls, stretching out to the media industry by providing new services enabled by the 5G network. Compared to the current 4G Long Term Evolution (LTE) mobile network, the 5G network provides 20 times faster speed for data transmission, allowing users to download a 2-gigabyte high-definition movie in less than a second. SKT is forging ties with over-the-top mobile video content provider Pooq, run by the country’s three terrestrial broadcasters, in order to strengthen its own platform Oksusu that aims to rival Netflix. SKT’s bigger plan is to spin off the Oksusu platform as one of four major subsidiaries along with the mobile network operator, and security and commerce arms. This is also part of SKT CEO Park Jung-ho’s plan to establish an intermediary financial holding company – dubbed “ICT holding company of SK Group — that take control of the current four business areas of SKT. KT is closely monitoring archrival SKT’s moves to start the new OTT business in a bid to lose out in the 5G content market. KT’s New Media Business Group will be led by Kim Hoon-bae, former CEO of Genie Music — the mobile carrier’s music streaming platform — this year, which will focus on developing creative 5G content for its customers. “KT is making efforts internally to develop content for 5G, for example the GiGA Live VR service on its IPTV platform,” said a KT official. KT is also expanding Olleh TV subscribers’ access to TV content further to their mobile devices by launching Olleh TV Mobile application. LG Uplus is gearing up for acquisition of CJ HelloVision, a cable TV channel provider under CJ Group, in order to enhance its cable TV business. If LG acquires the CJ channel, it would become the second-largest cable TV service provider, beating out SKT’s Broadband with a total of 24.43 percent market share. KT is currently the market leader with a 30.86 percent share. Taking a larger share of the pay TV market is becoming more important for the mobile carriers, because their internet protocol TV service subscribers are key customers for the home media business that would further develop into the future content business. In an effort to attract around 300,000 Netflix users in Korea, LG Uplus has partnered with the US OTT business to offer access to Netflix content via its IPTV platform. According to a report by KT Economics and Management Research Institute, the media industry is predicted to gain 3.6 trillion won in socioeconomic value by 2030 with the commercial use of 5G technology. The report also mentioned the 5G technology will bring augmented reality and virtual reality content to end users, creating a new category in the media market. This entry was posted in 5G and tagged Korea. Bookmark the permalink. South Korea has become the first nation in Asia to launch commercial 5G networks after three carriers, KT, LG UPlus, and SK Telecom, switched on services at midnight on December 1, 2018. 5G services are currently only available for enterprise users, with consumer mobile services not expected to be launched until March 2019. SK Telecom, which officially announced its 5G launch with a press release, appears to have the most extensive commercial deployment in South Korea to date with services now available in 13 cities and counties throughout South Korea. The carrier, which has previously unveiled 5GX as its 5G brand, said the first call over the commercial 5G network was made by its CEO, Park Jung Ho, between Bundang in Gyeonggi Province and Myeondong in Seoul using a Samsung 5G smartphone prototype. SK Telecom also named auto parts manufacturer Myunghwa Industry as its first 5G client. The carrier has placed a strong emphasis on the convergence of 5G and artificial intelligence and said Myunghwa is now using what it called the “5G-AI machine vision” solution to verify product quality. It also said test drives of 5G self-driving cars have begun on public roads. According to the Korea Herald, KT and LG UPlus marked the commercial switch-on of their respective 5G networks on the same date, although rollouts currently appear to be on a smaller scale. Various reports said KT launched its first 5G offering in Gwacheon, while the Korea Herald reported that the carrier has deployed 5G infrastructure in Seoul and six other metropolitan cities across the country. South Korea’s LG Uplus has revealed it aims to complete the deployment of 5G infrastructure in major cities by the end of the year. The operator plans to speed up the deployment of its 5G network and create various content and services for customers of the network, Yonhap News reported. LG Uplus has already deployed around 5,500 5G base stations, compared to an estimated 3,000 combined for rivals SK Telecom and KT, the report states. The three operators soft launched their respective commercial 5G networks in December as part of an agreement with the ICT ministry to launch simultaneously to avoid excessive competition. LG Uplus has revealed plans to invest over 4 trillion won ($3.55 billion) on a nationwide 5G rollout. The operator has also been stepping up preparations for the launch of the first 5G-enabled smartphones, which are expected to be released by sister company LG Electronics as well as Samsung in March. South Korean carrier KT Corp. and Finnish telecom equipment maker Nokia said Sunday they have agreed to work together to enhance 5G services and network operational efficiency. The two companies signed a memorandum of understanding (MOU) to jointly test 5G technologies, including network function virtualization and network slicing, to develop new applications and business models for enterprise customers. The signing came on the sidelines of MWC Barcelona, which will bring together industrial officials and experts from more than 2,400 companies starting Monday to share the latest mobile industry trends. Using Nokia’s portfolio of software applications and services, KT will test an end-to-end network service platform in the country for network slicing. Network slicing is a key feature of 5G that will allow carriers to tailor different parts of their network capacity to different subscribers and applications, like connected vehicles and Internet-of-Things (IoT) use cases. Network function virtualization is the combination of software and hardware network featured in a virtual network. According to industry researcher Market Watch, the network function virtualization market is expected to grow to US$19 billion by 2022. “Virtualization and network slicing will allow us to offer new and innovative services, such as connected cars, virtual reality, IoT use cases and smart factories, while helping us bring down our operational costs,” Jeon Hong-beom, KT’s chief technology officer, said in a statement.